For Christmas this year, I have been trying to find some fun and original decor that not only fits our home decor, but is childproof. Glass ornament wreaths, fragile displays, and easy to tear apart centerpieces are out with baby B on the move and little man in an especially grabby phase. I wanted something that would be a fun, stylish addition to a winter wine tasting (more on that soon), but could also be displayed anywhere in our home- and not break. 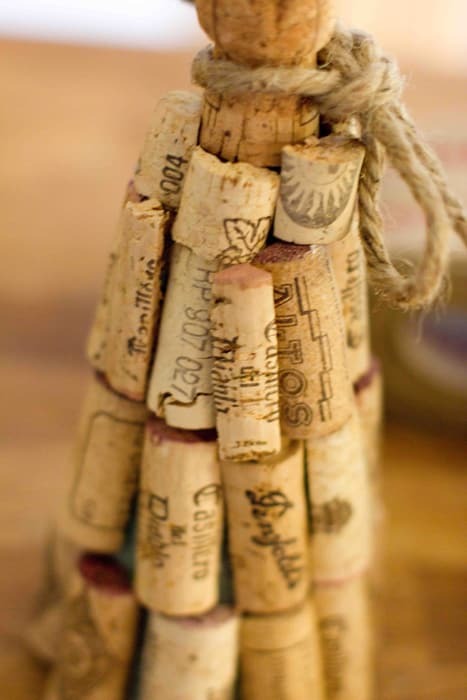 I’ve seen lots of great wine wreaths and trivets and decided corks would make a fun rustic tree! 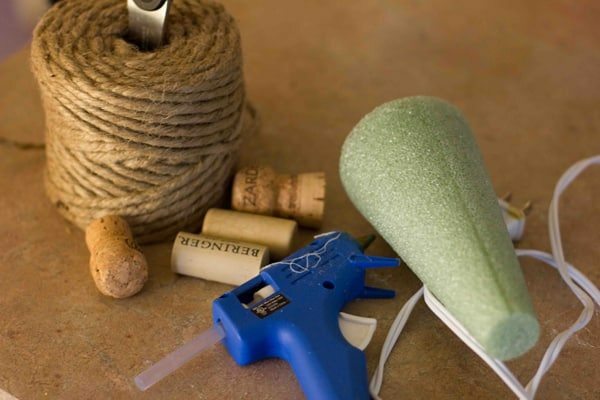 First off, you’ll need to estimate how many corks you’ll need, depending on your cone size. I used about 15 for the 6″ cone. 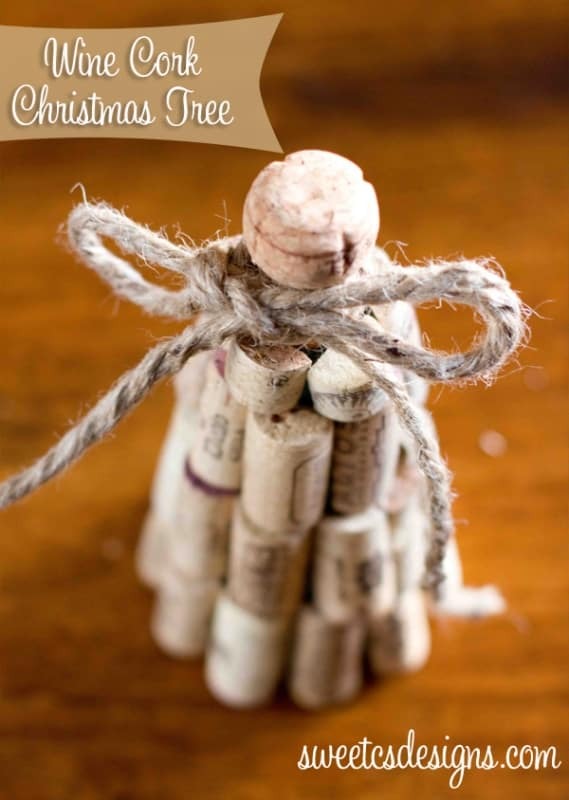 Next, you are going to cut your corks in half to make them lay flat and display better. At first, this might seem pretty tricky- but I found a way to speed it up and save your arms. 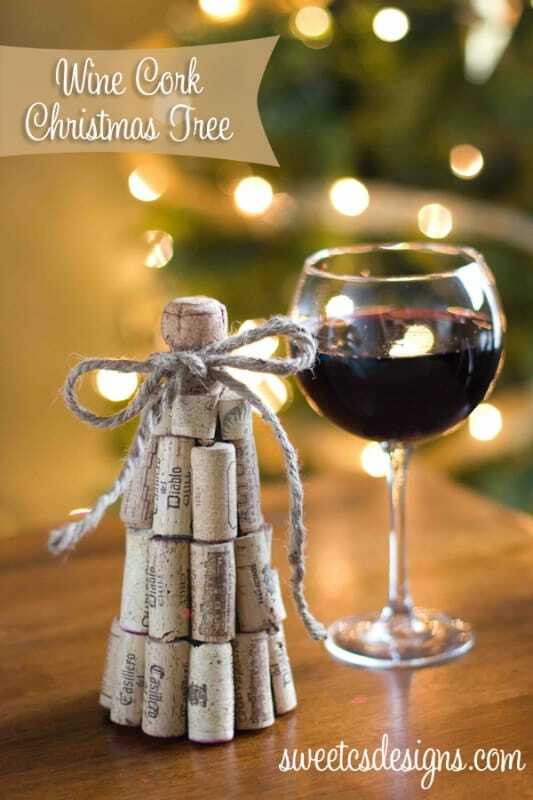 Stand the cork up on an end, and firmly hold the top with one hand (make sure your fingers are NOT in the way). With your other hand on the knife, make strong, sweeping motions downwards to cut- so you will basically be pushing the knife down and in towards you as you go. This is much faster than using a sawing style method to cut the corks… trust me. Next, start gluing the corks on. Start off by just placing them next to each other, but as you start to get around curves in the cone, you’ll leave some of the cone area uncovered so your corks arent all wonky looking. Keep them upright, not tilted (we’ll fill in the bare spots in a bit). Continue as many layers as you need for your height cone. 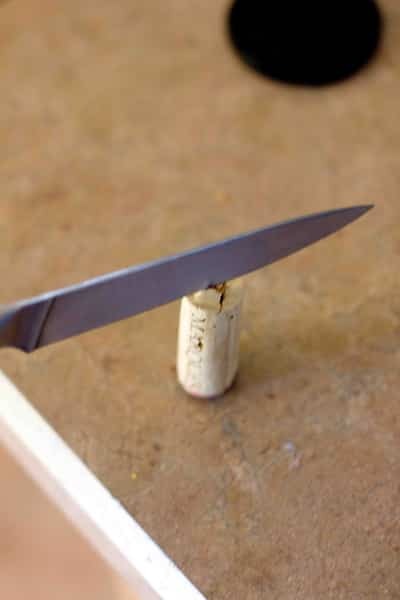 If your cone is not tall enough for another layer of corks (like mine), simply cut your flat corks in half lengthwise to make a mini layer at the top. Glue a champagne cork in the middle of the cone’s top. Next, slice any remaining cork halves into fourths. Find any bare spots on your cone and fill them with these cork slivers. (You wont have very many for the smaller cones- maybe 4-5). I <3 your blog! =) Thank you for sharing and inspiring us all!! I mentioned earlier in the comments above that I would host this particular DIY project on my DIY Friday posts and I did. I forgot to come back and link it so you could see my example! I had alot of fun doing this project and just wanted to thank you for your wonderful blog! OMG I LOVE this. Now I just need to find out where to get me some corks! Love this tree and that it is so quick to make! Your photos are beautiful! What a great idea! Turned out wonderful!! Love it and so easy! I have cones and corks! !